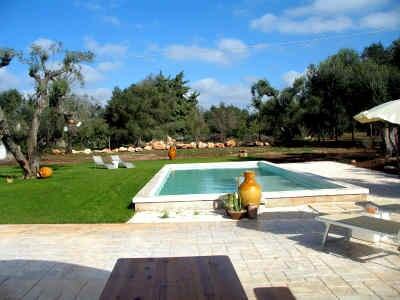 This beautiful property near the famous “White City” Ostuni consists of a trullo and a lamia, which can be booked separately but also together, making it perfect for groups or large families who want to spend their holidays in Apulia. Both accommodations are deliberately sufficiently distant from each other to ensure privacy. The heart of this country residence is surely the large swimming pool (4x15m, 1.30m depth) between the two holiday homes, which has a spacious sun terrace and a shaded terrace area and is available from April to October. The trullo has been completely renovated with care, so that now under the characteristic cashmakers and between the thick walls of the former farmhouse a living room with TV, a bedroom with a French bed (1,30 m), a double bedroom with access to the terrace another double bedroom, a small toilet and a shower room. Bright and sunny, it reflects the colors of this landscape again – the yellow of the bright sun and the white of the bright local typical stones. Vacation time is also synonymous for outdoor dining, grilling, relaxing and reading. There is a pavilion in front of the Trullo, which provides adequate shade, as well as a barbecue and an outdoor shower behind the house. Simply a charming holiday destination for up to six people to spend an unforgettable holiday in Italy. On the opposite side of the pool is the Lamia, which sleeps 4 people. Due to the colors used and the interior, the Lamia has a very summery flair and offers you in the middle of the house a living room with TV and on the right and left side of each one a double bedroom with its own shower bath. From the living room and the two bedrooms you have access to the wide covered and furnished terrace in front of the house, overlooking the pool. Day trips are of course recommended to Ostuni, the historic center of the white city is simply impressive, with old palaces, churches and narrow streets. But the Baroque city of Martina Franca and the small town of Cisternino are also worth a visit. To the nearest beach is the kilometer long beach Ostuni Marina, which is only a few kilometers from this country house. Then there is the Trullo city of Alberobello, the nature reserve Torre Guaceto, the caves of Castellana … As you can see, there is a lot to discover in Apulia! – 30% deposit to be paid within 7 days after booking. Balance on site on arrival day. Price incl. water, gas for cooking, bedlinen, towels, electricity, final cleaning. Payable on site: Kaution € 250,00.